Finding business offices or entertainment joints in a foreign country or city can be an uphill task. To solve this problem completely, MY COM has developed an application called MAPS.ME that is tailored to provide accurate maps of all countries in the world. It is compatible with iPhone, iPad, and iPod touch devices. The default languages are Korean, Spanish, Thai, Swedish, Ukrainian, Turkish, Simplified Chinese, Danish, Polish, Arabic, Italian, English, Czech, Japanese, Slovak, Portuguese, and Traditional Chinese. MAPS.ME is a reliable application that you can use to find your way around cities and countries all across the globe. One of the major highlights of using this map app is that your phone does not have to always be connected to the Internet as the maps are secured in its database. All you have to do is search for a map that resonates with your current location and needs. Since its introduction to App Store, it has generated over 15 million downloads from all across the globe. It is also ranked as the best Travel App in over 100 countries and it has been featured in Washington Post, TechCrunch, and Forbes. Despite the exceptional features that this app offers, the app is quite easy to use as it has a dynamic interface that is extremely easy to interpret as compared to other similar applications. The database is updated periodically to ensure that it meets the diverse users’ needs. By downloading this application, you will get accurate direction to any location such as business premises as long as it is available in the database. Auto-follow mode is one of the major highlights that give this application an upper hand in the market. When activated, the maps will automatically synchronize or adjust itself to the direction that you are moving. Hence, it can provide real-time directions as your drive all walk on the streets. Location sharing is another feature that you should lookout for in MAPS.ME mobile application. Simply put, it allows users to send a pin of any location on the maps to friends or colleagues via email or SMS. More importantly, you can bookmark, import, or export other maps for future reference. It is also important to note that KMZ/KML files are compatible with this application. As mentioned earlier, your device does not have to be connected to the Internet. You can use it to discover tourist destinations, hotels, petrol stations, casinos, and more. 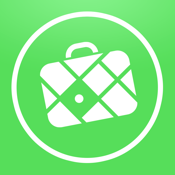 MAPS.ME is one of the best map apps for iPhone and iPad that you can use to travel in foreign countries with ease. The maps are in high-definition to ensure that you never get lost again.